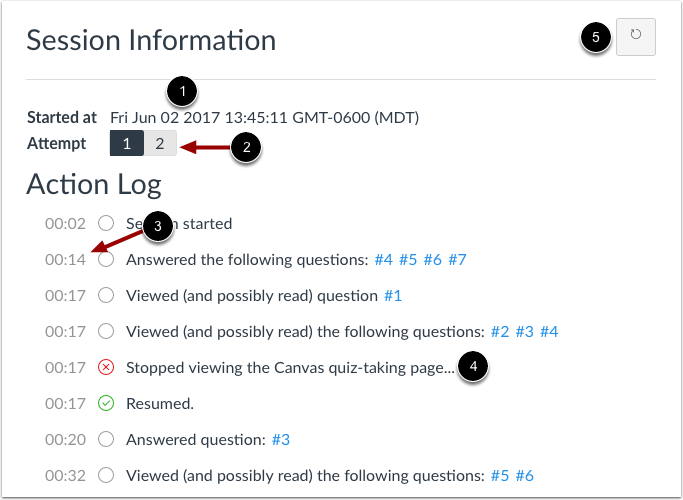 I find it very frustrating that the Canvas quiz log seems to be inconsistent. I walk around the room and answer questions. Needless to say, I cannot watch one student throughout the entire exam. Students are given clear rules regarding leaving the screen while taking an exam in Canvas. I think it is important to mention that 31 out of 34 students did not have one record indicating "stopped viewing the Canvas quiz." I understand that after 30 seconds of inactivity, the log marks as stopped viewing the Canvas quiz and after 15 seconds if viewing another page in Canvas or outside of Canvas. The attached logs were created by the same student. The suspicious activity and numbers of "stopped viewing the Canvas quiz," are excessive and cannot be ignored. Any insight or suggestions are welcome. Sheere, I’m not sure what you mean by inconsistency, but it does look like the student might have been doing some things tbeh shouldn’t have during the quiz. My recommendation is to contact support and see if they can add some information to this. They have access to more information than you’ll see in the quiz log. To do this, click on the Help link and Report a Problem. Thank you, Kona. By inconsistency I mean the log records him as "stopped viewing the Canvas quiz" within the 15 second rule. Many are less than 5 seconds. I question the "15 second rule" as I'm guessing you read on this page How do I view a quiz log for a student? . I question it based on your results and even the screenshots on that page. They show the Stopped viewing alert within the same second of viewing. My personal take on any logs is that they only tell a part of a story and there probably are things that could interfere with them being accurate. Canvas can really only log what is going on inside of the browser window it's running in. And I have that being able to report that someone left a page is somewhat controlled by the web browser itself. I also bet that things like Add ins or browser extensions could impact some of the information gathered in these type of logs. Just my thoughts above. Looking at your logs I'm inclined to believe that the student viewed another tab or browser window at the points marked in red, but I would be considering many other things before accusing the student of that. Thank you, Rick. I agree, that the log is just part of the picture, however, the log also gives us the number of times a student answered a question and when specific detail was added. When I grade essay questions, I am looking for specific detail in their answers. If a student adds specific detail after it is recorded that he/she has stopped viewing the Canvas quiz (15 seconds) and returning to the question 50 plus times, I am going to assume they are looking up answers.